I raced a Benelli 650 Benelli for about 15 years which ended up in a Chrome Molly Norton Wideline Frame which was called a Beneton!!. I raced it everywhere in the Post Classic unlimited class which resulted in it being a fairy high strung motor. The last straw was qualifying on the front row at Phillip Island "in the rain" & blowing the thing to pieces. This seemed to happen on a regular basis in the first race of the day so after watching everyone else racing around all weekend I said to my wife I'm going home to turn my road bike into a race bike. At least I’ll get to ride around all weekend & that's how I started on my Moto Guzzi Lemans Racer!! To fit into the Period 4 era I had to make a few changers. 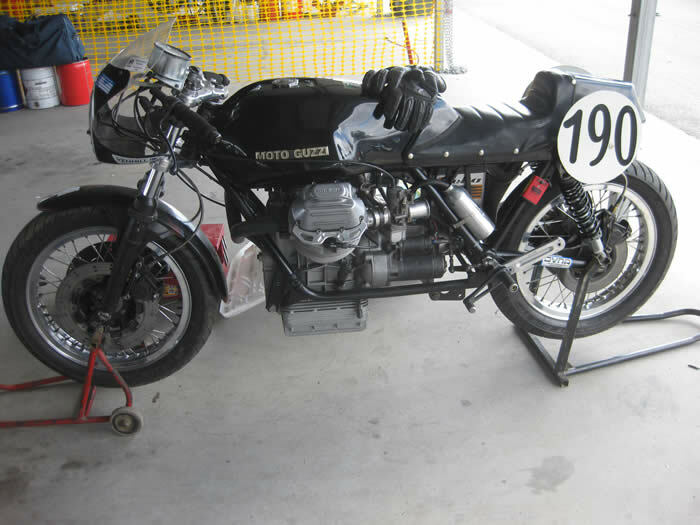 I based my Lemans on a Moto Guzzi Imola Replica which was raced at Imola in 1971/72 & logged booked on that info. Mick Walker imported them for racers!! I found some wire wheels in the states which are pretty hard to come by so they were not in the best condition. It probably took me over 100 hours do all the mods & to get it run properly. I pulled the engine apart for a full rebuild at least twice. At least I can buy the spares where with the Benelli I had to make them!! I was really looking for reliability out of the Guzzi. Mico polished crank & lightened & Balanced to 50.5% at 5,000rev's & above. Robbie Olsen's 2 into 1 "Which are a work of art" ceramic coated in & out. Super Trapp exhaust & degutted reworked & racing end cap!! Enlarge oil inlet & late model hi flow oil pump. light weight. I hope to race around the place again in the next few years so hope to see you out there having fun.